When are you planning to release Android – 8.0 Oreo ROM for Khadas VIM2 box? Probably Khadas Team will work on ti as soon as Amlogic create Oreo SDK available for 905* and others SoC. It’s up to manufacturers if they are going to use it or not. any news about Android Oreo ROM release or updated Android Nougat ROM this month? The Oreo codes are uploading to Khdadas Github now, still exist many issues, and the preview ROM will also release soon, mostly like tomorrow. Any news about Oreo preview of stable for VIM2? Do you have plans to release a new stable Nougat version with solved issues for VIM2? Yep, as Oreo still in developing and seem that not quite stable, so we will still release Nougat for both VIMs. Can you guys tell us when will the Android O available for the Khasas VIM and Khasas VIM 2? Android Oreo was available for the Khadas VIM at long time ago. But VIM2 need to wait for more time. Here release the Android Oreo preview ROM, check Firmware Page to download the ROM. ROM Infos: ROM version: VIM_Oreo_Preview_V171229.7z MD5SUM: 192513e0aedd98fd4090d56645ed2251 The ROM is for EMMC installation only Upgrade guidance: Upgrade on Windows PC with USB-C Cable Upgrade on Windows PC via SD burning card Enjoy & happy new year! Oreo source for s912 from amlogic seems to be available from april 2018. Are there any specific issues holding from having Android Oreo on VIM2? Also, how do you root Oreo - does the same building with SuperSU applies to Oreo as well? Amlogic only release Android 8.0 for S905X(VIM1) and S912(VIM2). We are waiting for them to release Android 8.1. BTW, we don’t plan to release Android 8.0 for VIM2. So I’m guessing appropriate SuperSU will come along with Android 8.1? Do you have any plans to release Android 8.1 or Android 9 ROM for VIM2 soon? If not, maybe you are planing to release the updated version of Android 7.1.2? Because current ROM -VIM2_Nougat_V180619.7z is pretty old and have some unsolved issues: color blinking errors in youtube app, accidentally screen blinking, hotspot 2.4 Ghz and 5 Ghz is not stable and works only for 10 minutes, hotspot can’t be started automatically after VIM2 boot, TWRP recovery is not working, and other small issues. @terry check the plan and respond. 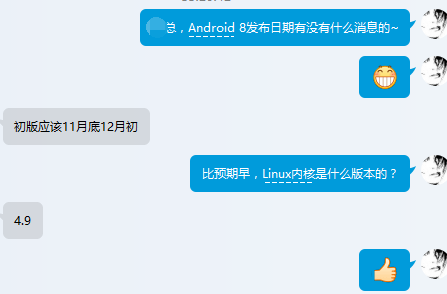 The amlogic official hasn’t a plan to release S912 Android 8.1 or Android9 ROM. But the issues you listed, we will check it. Thanks.